My fourth trip of 2016 saw me heading off to the Netherlands recently. 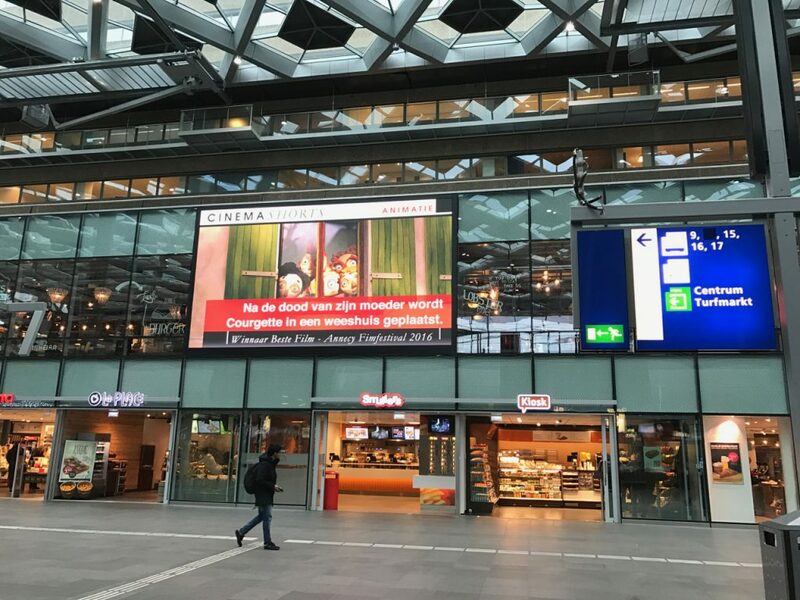 It’s a country I really love, and after a trip to Rotterdam a couple of years ago and Leiden when I was a kid, my third visit to the land of cheese and tulips started in The Hague. I was there for three days for a mate’s 40th birthday. 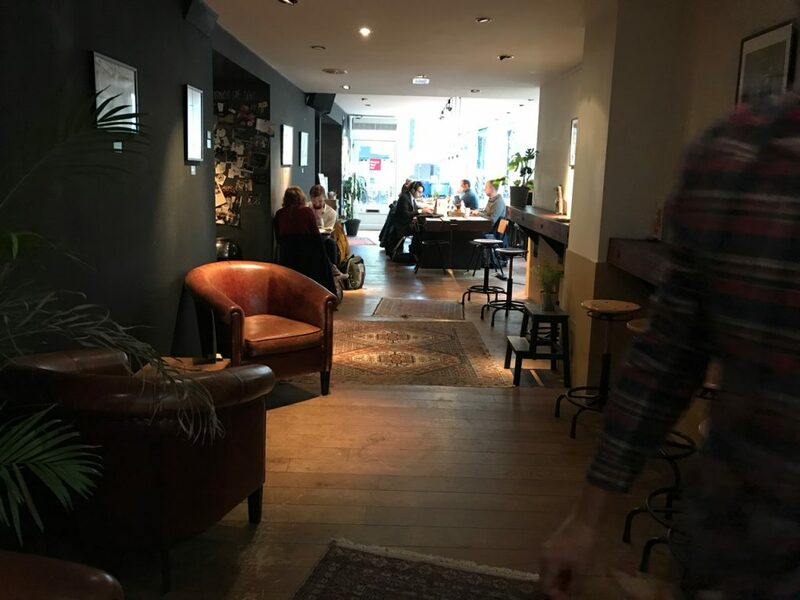 So Monday morning saw me wave two of the birthday party off at our apartment in The Hague before the other sole remaining member of the gang and I headed for a coffee at a little café just around the corner from our apartment. There seems to be loads of branches of Coffee Company around the Netherlands – I liked them. They’re a bit less chain like than the usual Starbucks, with each café having more of an individual feel and decor. John and I had ham and cheese on toast (not for the first time on the trip!) and reflected on the last couple of days – which had mostly involved a lot of drinking 🙂 and attending gigs at the Crossing Border festival. Then it was time to head back to the apartment, grab our bags and head to the train station. The trains in the Netherlands – just like I’d found in Denmark and Japan (in particular) – are spotless, and run on time – I can’t understand why that’s never the case here in the UK! John was heading straight to the airport, so had to get a different train. 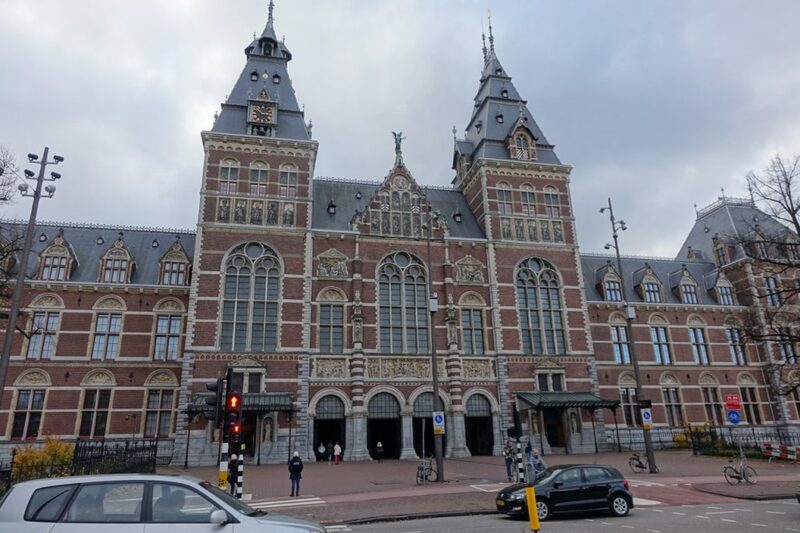 I hung around for ten minutes or so and then jumped aboard my train to Amsterdam Centraal – a journey of about 45 minutes which cost €11.50. 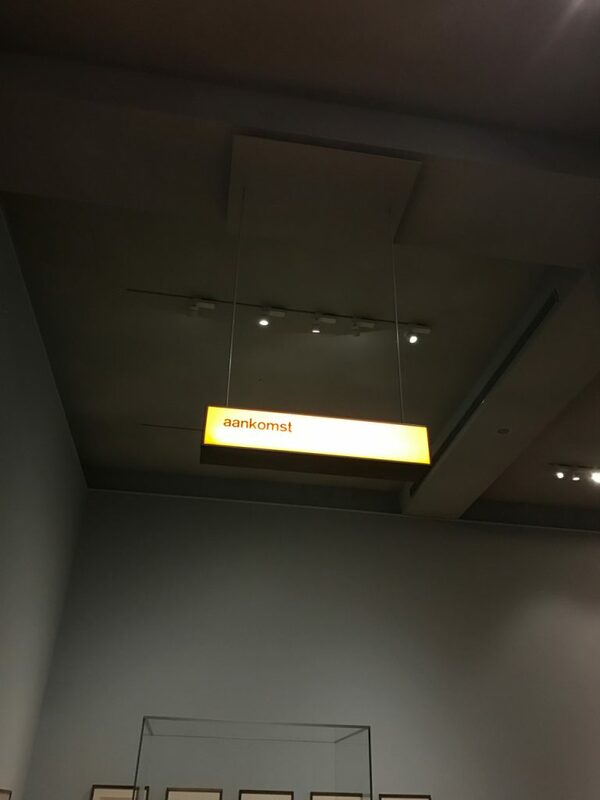 It was comfortable enough, and the free wi-fi meant I could check out what I wanted to do when I arrived. 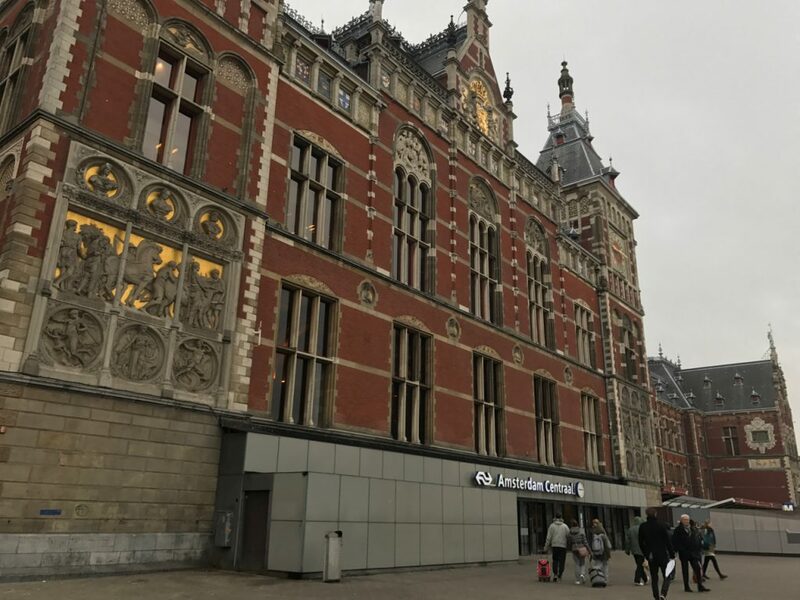 Amsterdam’s main station is beautiful – really an impressive building. Thankfully my mobile plan gives me free data in the Netherlands, so I looked up Google Maps and headed to my hotel. 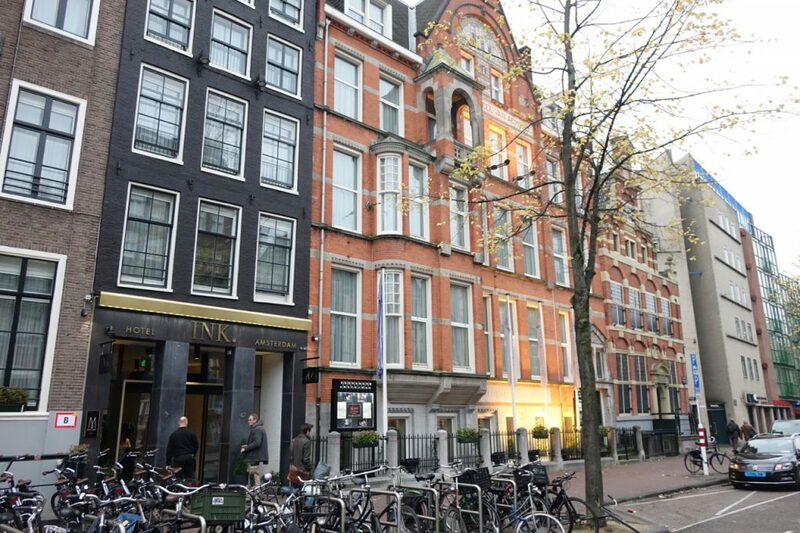 I’d booked two nights at the INK Hotel Amsterdam – actually a Sofitel. It was only a ten minute walk from the station, on Nieuwezijds Voorburgwal (NO idea how to pronounce that!) so after managing to dodge numerous cyclists (I found it hard to tell where the pavement stopped and the bike lanes started), I found my way there pretty quickly. Even though I was early, I was able to check in and get to my room. 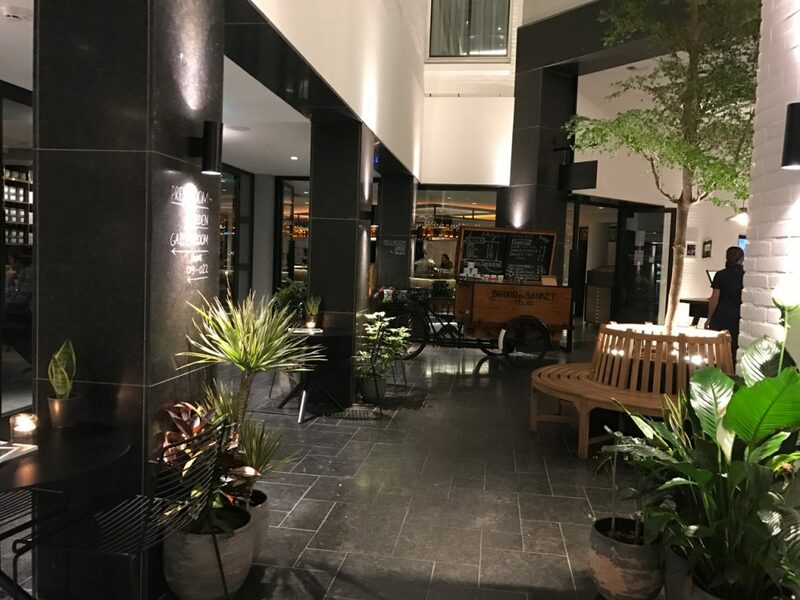 I was really pleased with the hotel – the lobby was kind of cool and funky, and the restaurant and bar looked like a good spot to spend some time as well (even though I wouldn’t get a chance). Apologies for that photo being a bit squint – I was taking it on the sly. 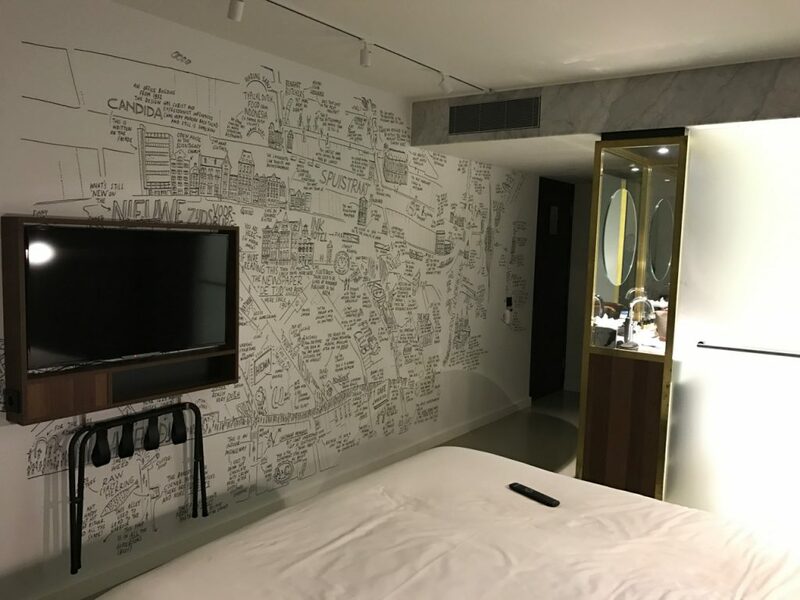 My room was also great – I’d read some online reviews that people didn’t really care for the bathroom arrangement. It has a window facing in to the bedroom – but I wasn’t bothered by that. There was a massive bed, and a Nespresso machine with free coffee pods. 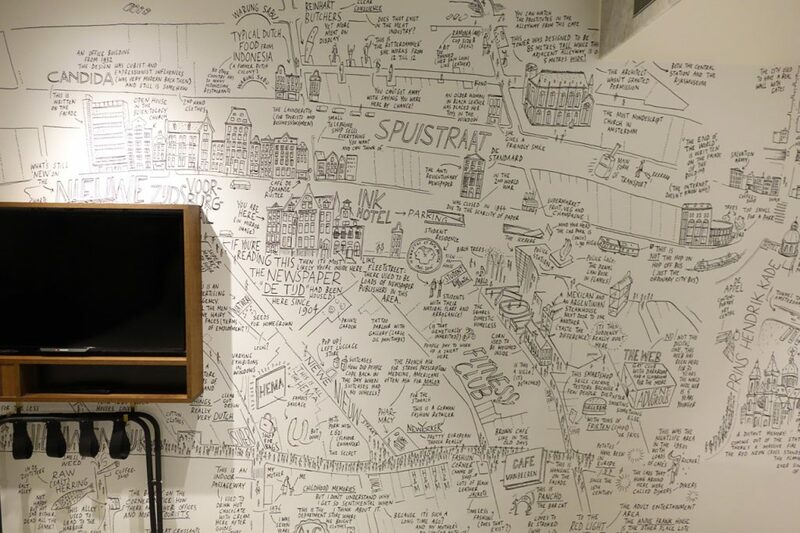 My favourite part of the room though was the hand-drawn quirky map on the wall by local artist Jan Rothuizen. 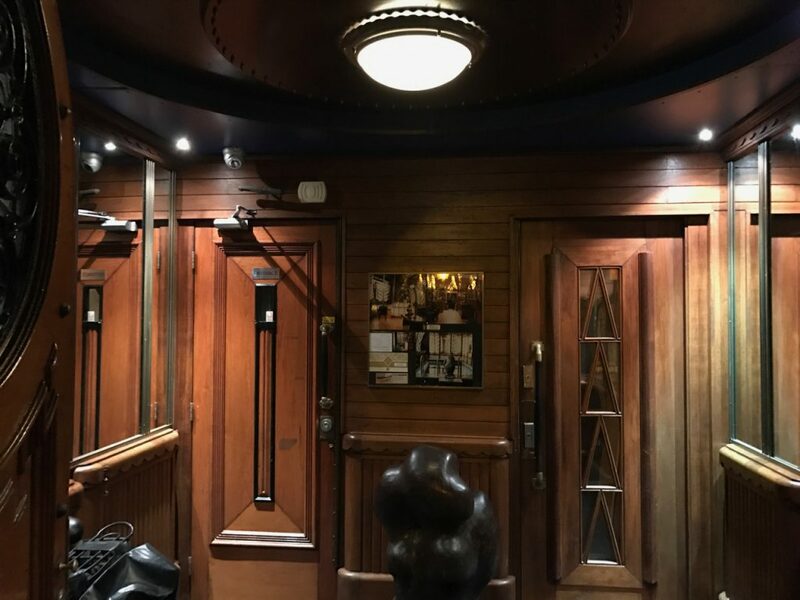 It was of the area surrounding the hotel, and picked out spots like local cafés, restaurants, historical places of interest, night clubs and so on. Really cool and interesting, and handy for getting my bearings too! After unpacking a bit, I headed off down Kalverstraat – a shopping street for a bit of a wander. 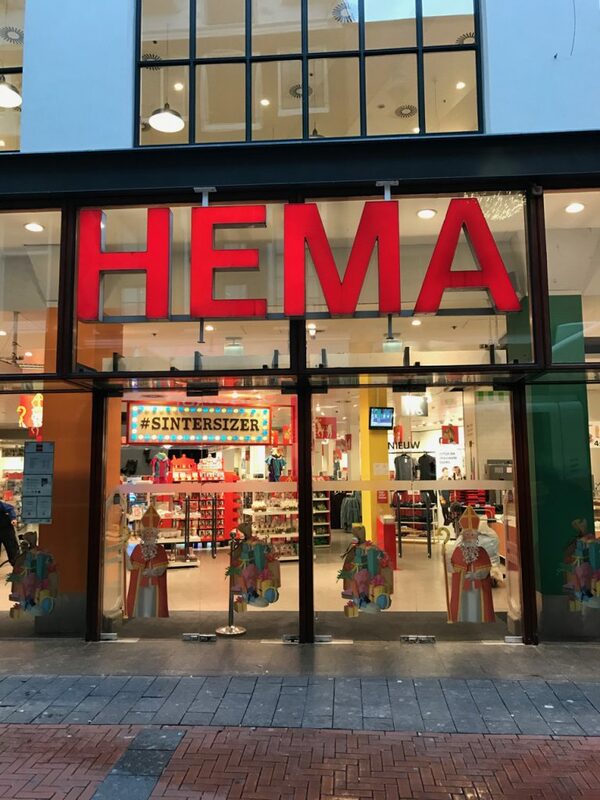 I nipped into HEMA for a quick look thinking I might get some early Christmas presents. It’s a cool store – kind of like a cross between IKEA, a clothes shop and a supermarket. I guess the closest shop we had would have been the old Woolworths. HEMA’s hot dogs are legendary too. No luck with the presents though. 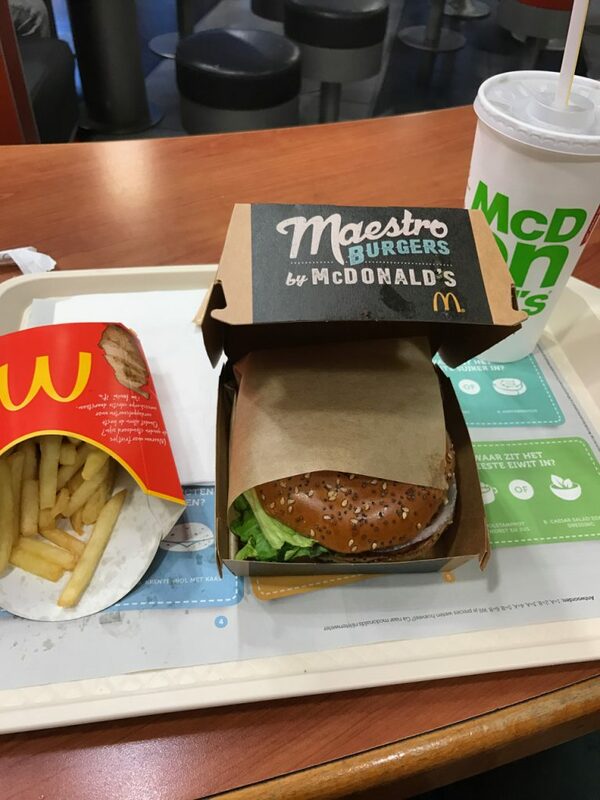 Right – for lunch, ‘fess up time, it was McDonald’s. I hadn’t had a chance to visit on this trip yet, and it’s got to be done on each of my travels to try the local speciality or unique burger offering of the time! I decided to go for the promotional burger – the Maestro Burger, with bacon, red onion, ketchup and wild mustard. You can’t really tell from the picture but it was enormous – I left absolutely stuffed! 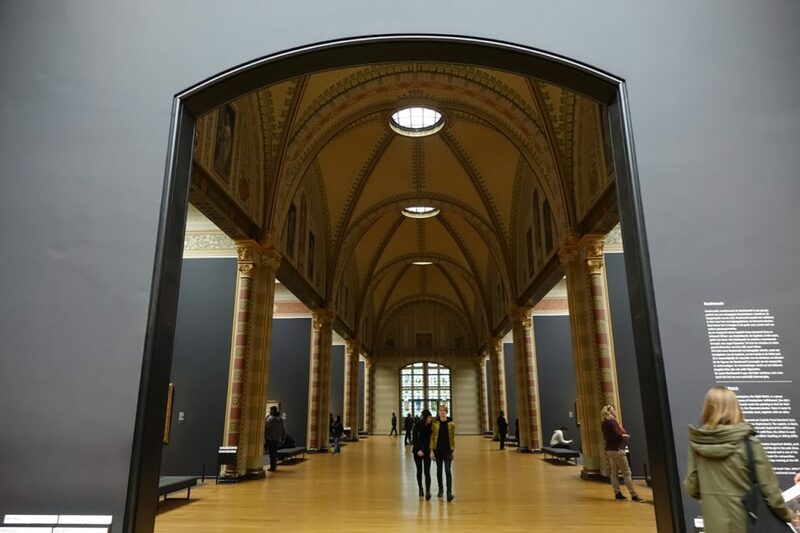 Next I headed back outside and wandered off for a cultural visit to a Dutch national museum and art gallery – the Rijksmuseum. It was really calming on the twenty five minute walk. 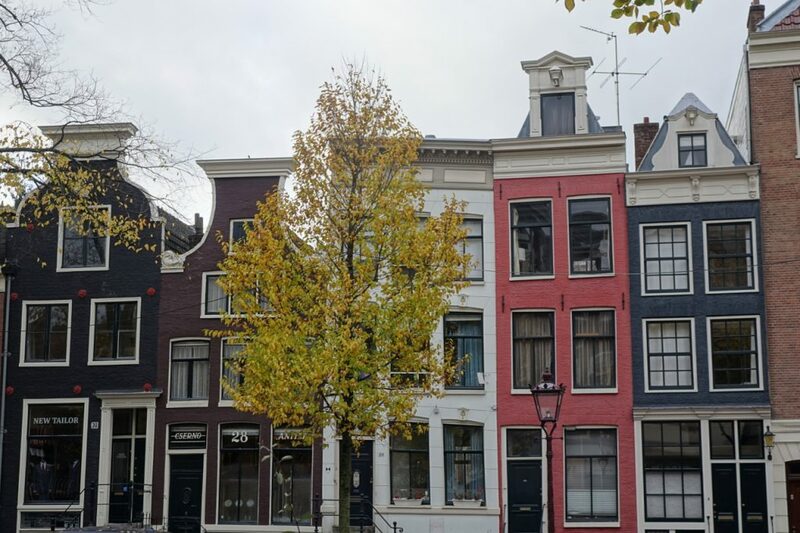 Even though it was freezing, I got a good stroll around the city centre, and came across loads of little scenic canals bordered by typically Dutch buildings – houses, offices and small shops and restaurants. 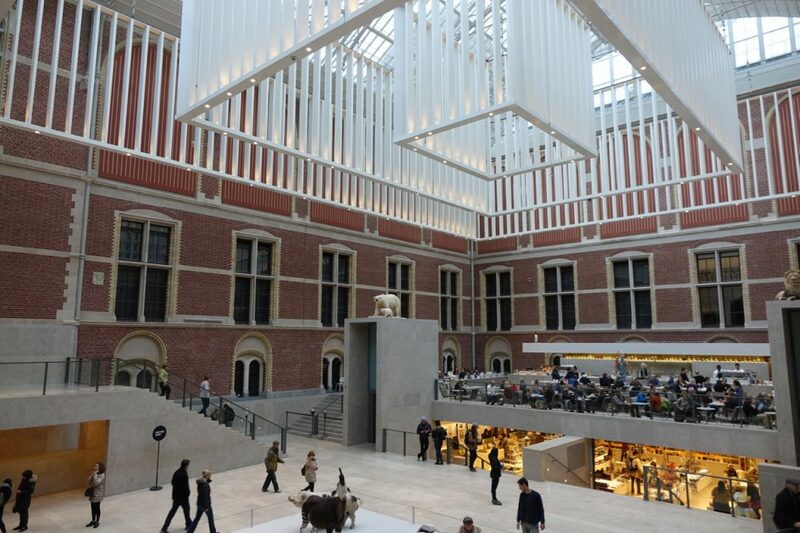 Soon I arrived at the imposing building that houses the Rijksmuseum. It’s absolutely enormous. I couldn’t really get a good vantage point to get the whole building in. I walked underneath the building, and made my way into the entrance – and was really surprised. From the outside you’d expect it to be really old and foosty but in fact it was the exact opposite – modern and really airy and light. The foyer was pretty spectacular. I bought my ticket (€17.50) and wandered off to explore the exhibits. I was quite determined to make it around every part of the building and see as much as I could. I headed up to the very top floor, which is where the more modern, contemporary exhibits were. 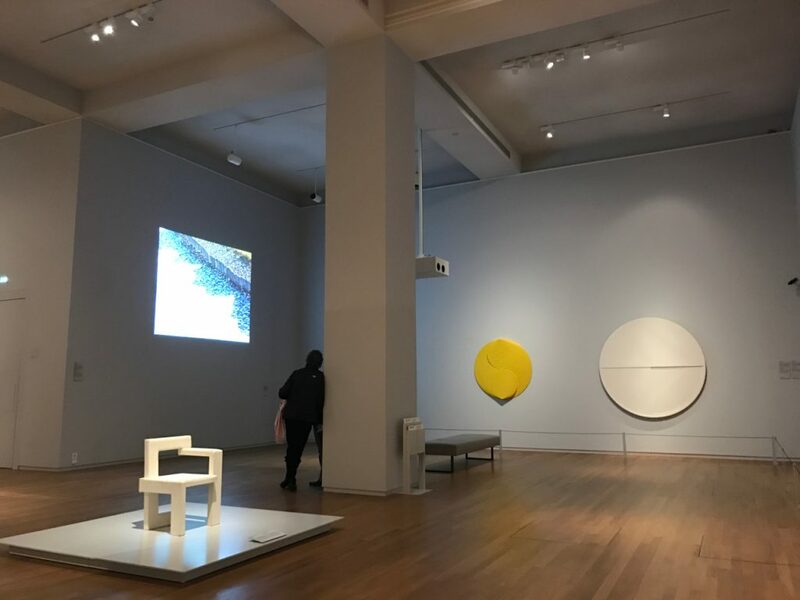 There wasn’t really that much to see in that area – some modern design works and installations – but there were some interesting bits too, like an explanation of the design used in Schiphol Airport’s signage. As I wandered downstairs to look at more historical bits of art, it was hard not be impressed by the sheer size of the place – it’s absolutely enormous, and it ended up taking me a good three hours to get around. I did end up getting a bit lost as well, as some floors are split into two sections, which can’t always be accessed from the same level. It’s a wee bit confusing, so if you go, don’t lose your map, and pay attention to it! 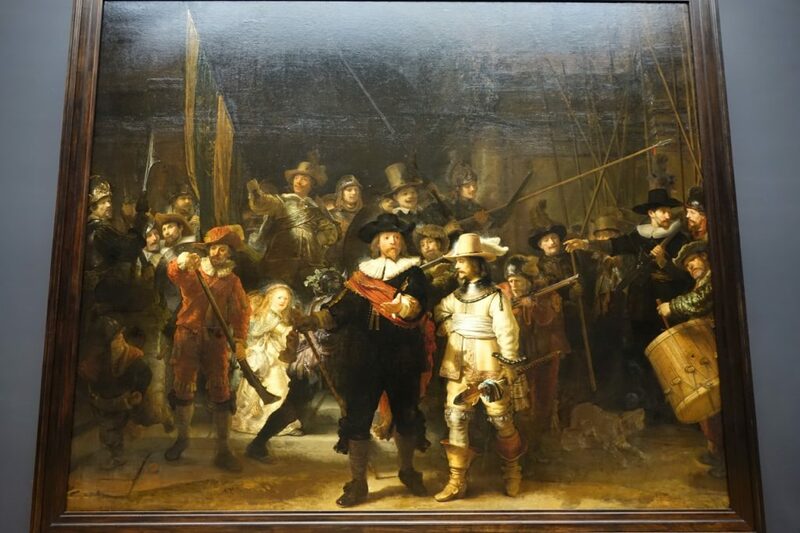 Soon I came across probably the museum’s most famous exhibit – The Night Watch by Rembrandt. There were big hard card guides you could pull out from a holder in the wall and take up to the picture which I found really useful. They explained different bits of the painting that you’d just never otherwise notice. 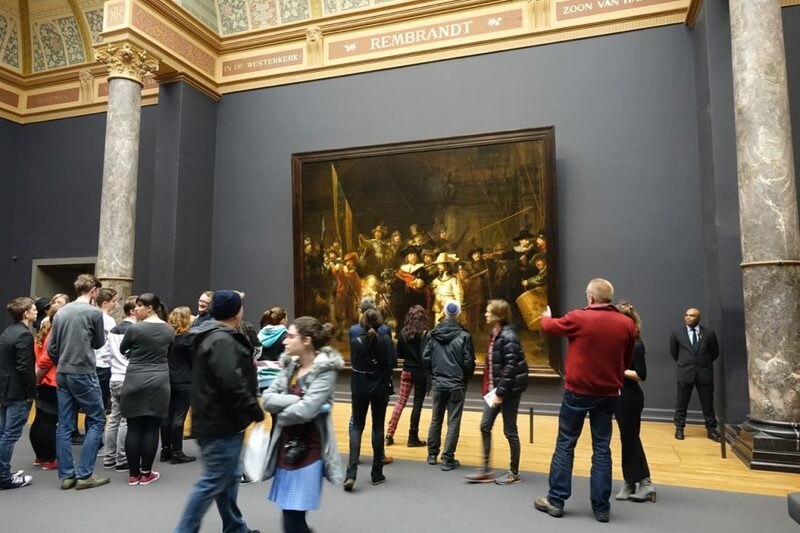 Apparently what makes this picture so special is that up until then groups of people had never really been captured doing stuff in a painting – so Rembrandt was a bit of a trend-setter when it came to that. 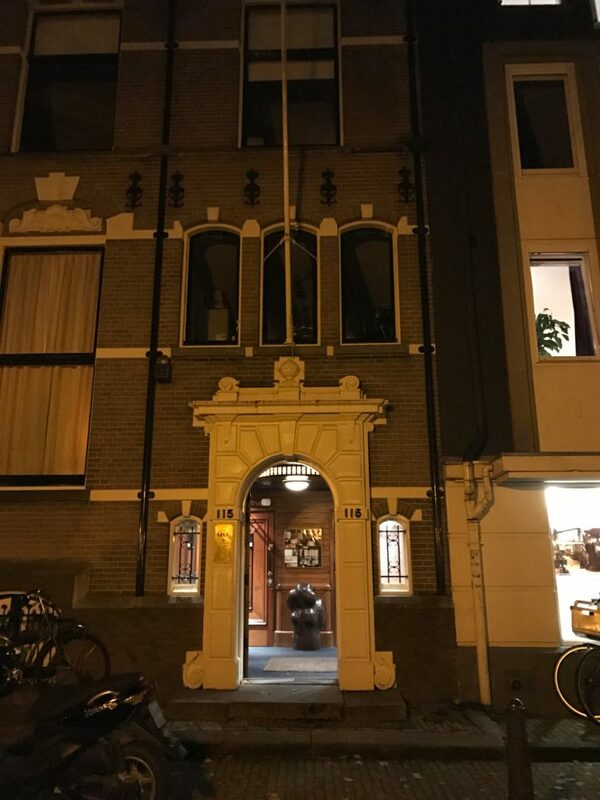 I’d been feeling a bit stressed out of late, so decided to book myself in for a massage on my first night in Amsterdam. Googling places before I left the UK, I liked the sound of one spa in particular – Sauna Deco. Weirdly the interior is from an old department store in Paris – the fittings were shipped to Amsterdam to make up the interior. It sounded a bit different, so I booked in for a massage, and headed there a bit early to try out the sauna and steam room. That’s the outside – you’re not allowed to take photos inside, so all I really have of the interiors are the photo of the entrance below. You get a bit of a taste of the interior there, but there’s loads more pics on the spa’s website. I headed in, got my locker key from the friendly attendant and paid the entrance fee (€23.50) and the fee for my massage (€35). One thing I would say is that you do have to be naked in the saunas, steam room and pool area – which considering the place is unisex may be a problem for some! I never really felt awkward about it at any time though – we’re all the same after all, right? The sauna was absolutely roasting, so I didn’t spend too much time in there, but the steam room was a more pleasant temperature. There was also a plunge pool, but dipping my toe in, I discovered it was bitterly cold. After my fainting experience in Iceland earlier this year, I decided maybe it wasn’t a good idea to go from hot to cold straight away, so I didn’t bother with a plunge. I sat and read a magazine (well looked at the pictures as it was in Dutch) in a relaxation area (in which towels are worn!) before my massage time came. The lady that did my massage (Simone) was really friendly. She asked why I’d wanted the massage, and then soon got to work. It was unbelievably relaxing – in fact it’s made me think getting a massage is something I need to do more often. Parts of it were slightly painful, but I took that to be a good sign! She also told me that my intestines were stressed but I think she may have mistaken the look on my face as I tried not to laugh (I’m tickly there) for pain. After my 25 minute session was up, I took one more trip to the steam room, and then headed back off into the by now freezing Amsterdam night. It had been a long old day, so rather than head out for dinner, I just grabbed a sandwich and my favourite chocolate milk from a local supermarket. Which – I discovered – only takes Maestro credit cards – I didn’t think they even existed any more? I headed back to my room to eat while I caught up on EastEnders. 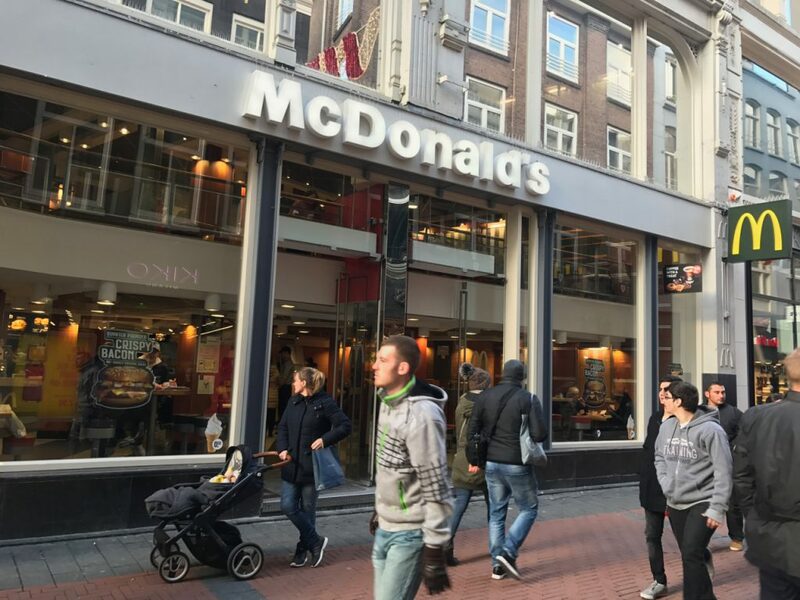 My next and last day in Amsterdam would see me return to a famous spot in the city that I’d last visited more than thirty years ago.